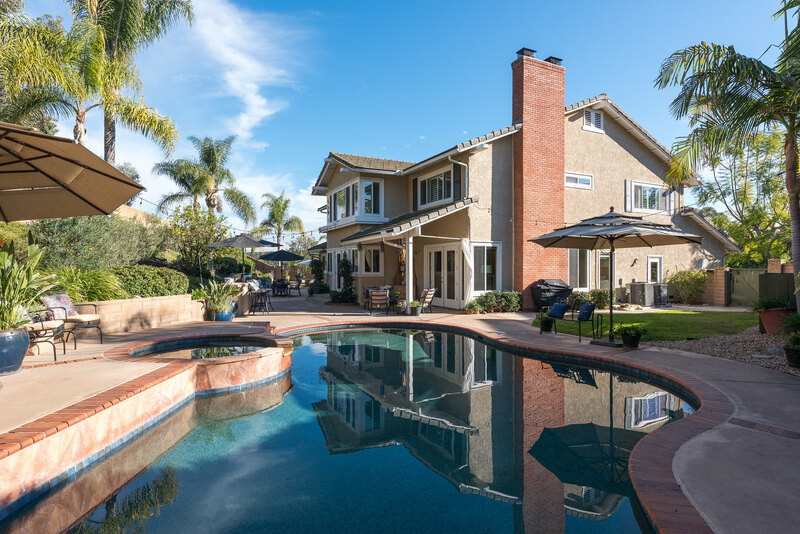 Located in a quiet cul de sac in one of Scripps Ranch’s most desirable neighborhoods, this beautiful home enjoys ultimate privacy and a spacious living space. Remodeled kitchen, remodeled bathrooms, Cathedral ceiling, Gleaming oak wood floors, new windows, fully owned solar system are few of a long list of upgrades! Amazing backyard with sparkling pool and spa, BBQ island, mature trees & fruits trees! Chantemar offers a community pool, 2 tennis courts & low HOA. The large living room features cathedral ceilings, a see through brick fireplace. Additionally, there is an extra room, perfect for an office, music room. Off of the foyer, is a large bright dining room with French doors that lead to the huge backyard. The remodeled kitchen creates an inviting open space with custom cabinetry, granite counter tops, stainless steel appliances, large island. The large family room has a warm wood burning fireplace & French doors that also lead to the backyard and pool area. Bright master suite with Cathedral ceilings. The adjacent room with fireplace is a perfect retreat for a quiet room, office or nursery & could also be easily transformed into a 4th bedroom.The master bathroom with two generous closet spaces, features double sinks, an extra large shower and a separate large tub. The 2 other large bedrooms with ceiling fans, share a remodeled bathroom with 2 sinks, Quartz counter tops. This home also features a fully owned 7.7 KW solar system, new windows & newer roof, custom blinds, dual forced air heating & A/C, & much more! Huge backyard with pool, spa, BBQ island, mature trees , fruits trees. There is a fully automated and efficient water conservation irrigation system for both the front and backyards and a zeroscape side yard!